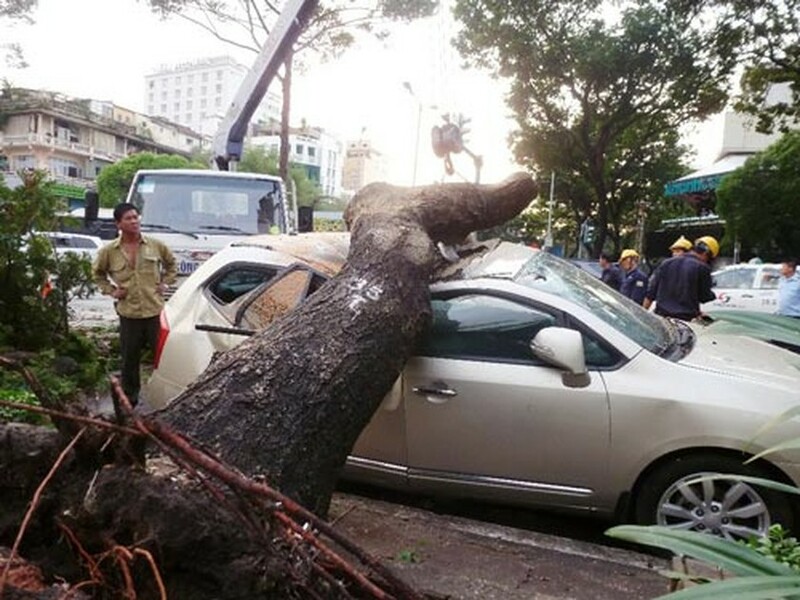 Strong winds and heavy rain sent trees and an electric pole crashing down in Ho Chi Minh City during rush hour on May 28, damaged cars and a motorcycle. At 4 PM a large tree that was over 10 meters tall toppled over at the junction of Le Loi and Nam Ky Khoi Nghia Streets in District 1. It fell on a seven-seat sedan and a taxi, and one person was slightly injured. In Dong Du Street in District 1, a tree measuring 0.5 m across fell on a seven-seat car parked below. Luckily, there were no casualties. But two people on a motorcycle were injured when an electric pole fell on them on Pham Viet Chanh Street also in District 1. The fallen trees and heavy rain caused traffic gridlock, which was worsened by people stopping to gawk at the accidents. Traffic wardens arrived to regulate traffic while the trees were cleared by workers from the Ho Chi Minh City Tree and Park Company.